AS Roma tickets are extremely popular and in high demand. A.S. Roma stands for Associazione Sportiva Roma is a top Italian Football club. At GoSportsTickets.com we offer a wide selection of A.S. Roma tickets for excellent prices. 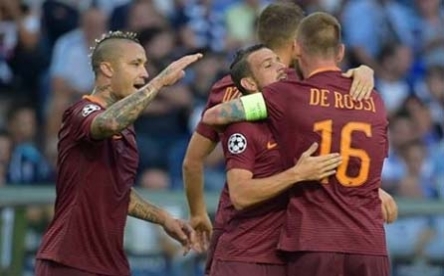 Roma have won Serie A three times, first in 1941–42 then in 1982–83 and again in 2000–01, as well as winning nine Coppa Italia titles and two Supercoppa Italiana titles. On the European stage Roma won an Inter-Cities Fairs Cup in 1960–61, coming close to European Cup victory in 1983–84 and finishing as runners-up in the UEFA Cup for 1990–91. The Nicknames of AS Roma are “The Yellow-Reds”, “The Magic One” and “The Wolves”. Home games are currently played at the Stadio Olimpico, a venue they share with city rivals Lazio with a capacity of over 72,000. If you want to secure your seats please book AS Roma tickets now and join the excitement. We will deliver your AS Roma tickets to your Home or Hotel ASAP and in time.